Guest post by AWS Serverless Hero Aleksandar Simovic. Aleksandar is a Senior Software Engineer at Science Exchange and co-author of “Serverless Applications with Node.js” with Slobodan Stojanovic, published by Manning Publications. He also writes on Medium on both business and technical aspects of serverless. Many of you have built a user login or an authorization service from scratch a dozen times. And you’ve probably built another dozen services to process payments and another dozen to export PDFs. We’ve all done it, and we’ve often all done it redundantly. 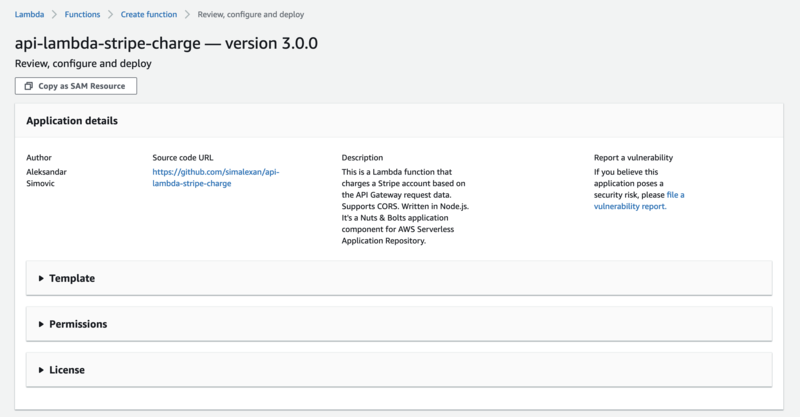 Using the AWS Serverless Application Repository, you can now spend more of your time and energy developing business logic to deliver the features that matter to customers, faster. 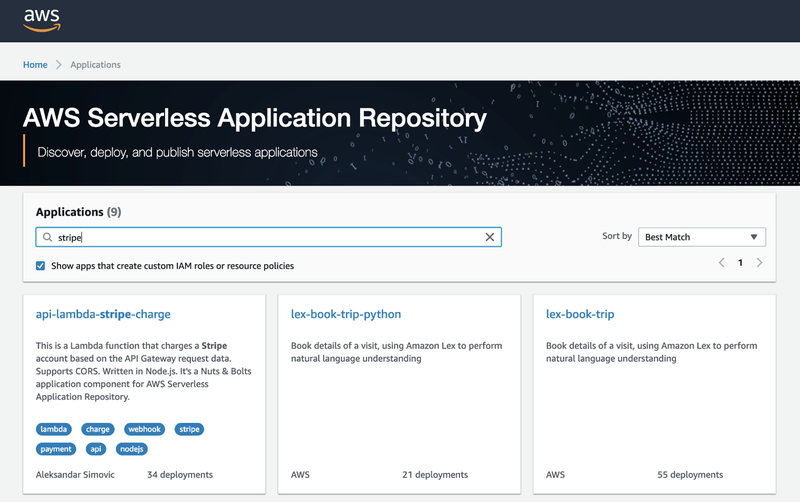 The AWS Serverless Application Repository allows developers to deploy, publish, and share common serverless components among their teams and organizations. Its public library contains community-built, open-source, serverless components that are instantly searchable and deployable with customizable parameters and predefined licensing. They are built and published using the AWS Serverless Application Model (AWS SAM), the infrastructure as code, YAML language, used for templating AWS resources. I wanted to build an application that enables customers to select a product and pay for it. Sounds like a substantial effort, right? Using AWS Serverless Application Repository, it didn’t actually take me much time. A product page with a Buy button, automatically tied to the Stripe Checkout SDK. When a customer chooses Buy, the page displays the Stripe Checkout payment form. A Stripe payment service with an API endpoint that accepts a callback from Stripe, charges the customer, and sends a notification for successful transactions. Even with the pre-built page, integrating the payment service is still work. But many other developers have built a payment application at least once, so why should I spend time building identical features? This is where AWS Serverless Application Repository came in handy. I selected the application titled api-lambda-stripe-charge and chose Deploy on the component’s detail page. Before I deployed any component, I inspected it to make sure it was safe and production-ready. Deploy and run the component in a restricted environment. Monitor the component’s behavior and cost before using in production. This might appear to negate the quick delivery benefits of AWS Serverless Application Repository, but in reality, you only verify each component one time. Then you can easily reuse and share the component throughout your company. Here’s how to apply this approach while adding the Stripe component. There are two types of components: public and private. Public components are open source, while private components do not have to be. In this case, the Stripe component is public. I reviewed the code to make sure that it doesn’t give unnecessary permissions that could potentially compromise security. In this case, the Stripe component is on GitHub. On the component page, I opened the template.yaml file. There was only one AWS Lambda function there, so I found the Policies attribute and reviewed the policies that it uses. The component was using a predefined AWS SAM policy template and a custom one. These predefined policy templates are sets of AWS permissions that are verified and recommended by the AWS security team. Using these policies to specify resource permissions is one of the recommended practices for serverless components on AWS Serverless Application Repository. The other custom IAM policy allows the function to retrieve AWS System Manager parameters, which is the best practice to store secure values, such as the Stripe secret key. I wanted to ensure that the component’s main business logic did only what it was meant to do, which was to create a Stripe charge. It’s also important to look out for unknown third-party HTTP calls to prevent leaks. Then I reviewed this project’s dependencies. For this inspection, I used PureSec, but tools like those offered by Protego are another option. The paymentProcessor and pubsub values are adapters for the communication with Stripe and Amazon SNS, respectively. I always like to look and see how they work. Maintaining a separate, restricted AWS account in which to test your serverless applications is a best practice for serverless development. I always ensure that my test account has strict AWS Billing and Amazon CloudWatch alarms in place. I signed in to this separate account, opened the Stripe component page, and manually deployed it. After deployment, I needed to verify how it ran. Because this component only has one Lambda function, I looked for that function in the Lambda console and opened its details page so that I could verify the code. When everything works as expected in my test account, I usually add monitoring and performance tools to my component to help diagnose any incidents and evaluate component performance. I often use Epsagon and Lumigo for this, although adding those steps would have made this post too long. I also wanted to track the component’s cost. To do this, I added a strict Billing alarm that tracked the component cost and the cost of each AWS resource within it. After the component passed these four tests, I was ready to deploy it by adding it to my existing product-selection application. I copied and pasted an AWS::Serverless::Application AWS SAM resource, which points to the component by ApplicationId and its SemanticVersion. Then, I defined the component’s parameters. I set CorsOrigin to “*” for demonstration purposes. In addition to parameters, components also contain outputs. An output is an externalized component resource or value that you can use with other applications or components. For example, the output for the api-lambda-stripe-charge component is SNSTopic, an Amazon SNS topic. This enables me to attach another component or business logic to get a notification when a successful payment occurs. For example, a lambda-send-email-ses component that sends an email upon successful payment could be attached, too. For the second command, you could add parameter overrides as needed. My product-selection and payment application was successfully deployed! AWS Serverless Application Repository enables me to share and reuse common components, services, and applications so that I can really focus on building core business value. In a few steps, I created an application that enables customers to select a product and pay for it. It took a matter of minutes, not hours or days! You can see that it doesn’t take long to cautiously analyze and check a component. That component can now be shared with other teams throughout my company so that they can eliminate their redundancies, too. Now you’re ready to use AWS Serverless Application Repository to accelerate the way that your teams develop products, deliver features, and build and share production-ready applications. Join us this March to learn about AWS services and solutions. The AWS Online Tech Talks are live, online presentations that cover a broad range of topics at varying technical levels. These tech talks, led by AWS solutions architects and engineers, feature technical deep dives, live demonstrations, customer examples, and Q&A with AWS experts. Register now! March 26, 2019 | 11:00 AM – 12:00 PM PT – Technical Deep Dive: Running Amazon EC2 Workloads at Scale – Learn how you can optimize your workloads running on Amazon EC2 for cost and performance, all while handling peak demand. March 27, 2019 | 9:00 AM – 10:00 AM PT – Introduction to AWS Outposts – Learn how you can run AWS infrastructure on-premises with AWS Outposts for a truly consistent hybrid experience. March 28, 2019 | 1:00 PM – 2:00 PM PT – Deep Dive on OpenMPI and Elastic Fabric Adapter (EFA) – Learn how you can optimize your workloads running on Amazon EC2 for cost and performance, all while handling peak demand. March 21, 2019 | 11:00 AM – 12:00 PM PT – Running Kubernetes with Amazon EKS – Learn how to run Kubernetes on AWS with Amazon EKS. March 19, 2019 | 9:00 AM – 10:00 AM PT – Fuzzy Matching and Deduplicating Data with ML Transforms for AWS Lake Formation – Learn how to use ML Transforms for AWS Glue to link and de-duplicate matching records. March 20, 2019 | 9:00 AM – 10:00 AM PT – Customer Showcase: Perform Real-time ETL from IoT Devices into your Data Lake with Amazon Kinesis – Learn best practices for how to perform real-time extract-transform-load into your data lake with Amazon Kinesis. March 20, 2019 | 11:00 AM – 12:00 PM PT – Machine Learning Powered Business Intelligence with Amazon QuickSight – Learn how Amazon QuickSight leverages powerful ML and natural language capabilities to generate insights that help you discover the story behind the numbers. March 18, 2019 | 9:00 AM – 10:00 AM PT – What’s New in PostgreSQL 11 – Find out what’s new in PostgreSQL 11, the latest major version of the popular open source database, and learn about AWS services for running highly available PostgreSQL databases in the cloud. March 19, 2019 | 1:00 PM – 2:00 PM PT – Introduction on Migrating your Oracle/SQL Server Databases over to the Cloud using AWS’s New Workload Qualification Framework – Get an introduction on how AWS’s Workload Qualification Framework can help you with your application and database migrations. March 20, 2019 | 1:00 PM – 2:00 PM PT – What’s New in MySQL 8 – Find out what’s new in MySQL 8, the latest major version of the world’s most popular open source database, and learn about AWS services for running highly available MySQL databases in the cloud. March 21, 2019 | 9:00 AM – 10:00 AM PT – Building Scalable & Reliable Enterprise Apps with AWS Relational Databases – Learn how AWS Relational Databases can help you build scalable & reliable enterprise apps. March 19, 2019 | 11:00 AM – 12:00 PM PT – Introduction to Amazon Corretto: A No-Cost Distribution of OpenJDK – Learn how to transform your approach to secure desktop delivery with a cloud desktop solution like Amazon WorkSpaces. March 28, 2019 | 9:00 AM – 10:00 AM PT – Fireside Chat: Enabling Today’s Workforce with Cloud Desktops – Learn about the tools and best practices Amazon Redshift customers can use to scale storage and compute resources on-demand and automatically to handle growing data volume and analytical demand. March 26, 2019 | 1:00 PM – 2:00 PM PT – Speed Your Cloud Computing Journey With the Customer Enablement Services of AWS: ProServe, AMS, and Support – Learn how to accelerate your cloud journey with AWS’s Customer Enablement Services. March 26, 2019 | 9:00 AM – 10:00 AM PT – How to Deploy AWS IoT Greengrass Using Docker Containers and Ubuntu-snap – Learn how to bring cloud services to the edge using containerized microservices by deploying AWS IoT Greengrass to your device using Docker containers and Ubuntu snaps. March 18, 2019 | 1:00 PM – 2:00 PM PT – Orchestrate Machine Learning Workflows with Amazon SageMaker and AWS Step Functions – Learn about how ML workflows can be orchestrated with the rich features of Amazon SageMaker and AWS Step Functions. March 21, 2019 | 1:00 PM – 2:00 PM PT – Extract Text and Data from Any Document with No Prior ML Experience – Learn how to extract text and data from any document with no prior machine learning experience. March 22, 2019 | 11:00 AM – 12:00 PM PT – Build Forecasts and Individualized Recommendations with AI – Learn how you can build accurate forecasts and individualized recommendation systems using our new AI services, Amazon Forecast and Amazon Personalize. March 29, 2019 | 9:00 AM – 10:00 AM PT – Deep Dive on Inventory Management and Configuration Compliance in AWS – Learn how AWS helps with effective inventory management and configuration compliance management of your cloud resources. March 25, 2019 | 1:00 PM – 2:00 PM PT – Application Acceleration and Protection with Amazon CloudFront, AWS WAF, and AWS Shield – Learn how to secure and accelerate your applications using AWS’s Edge services in this demo-driven tech talk. 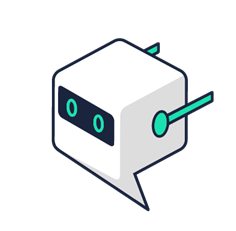 March 28, 2019 | 11:00 AM – 12:00 PM PT – Build a Robot Application with AWS RoboMaker – Learn how to improve your robotics application development lifecycle with AWS RoboMaker. March 27, 2019 | 11:00 AM – 12:00 PM PT – Remediating Amazon GuardDuty and AWS Security Hub Findings – Learn how to build and implement remediation automations for Amazon GuardDuty and AWS Security Hub. March 27, 2019 | 1:00 PM – 2:00 PM PT – Scaling Accounts and Permissions Management – Learn how to scale your accounts and permissions management efficiently as you continue to move your workloads to AWS Cloud. March 18, 2019 | 11:00 AM – 12:00 PM PT – Testing and Deployment Best Practices for AWS Lambda-Based Applications – Learn best practices for testing and deploying AWS Lambda based applications. March 25, 2019 | 11:00 AM – 12:00 PM PT – Introducing a New Cost-Optimized Storage Class for Amazon EFS – Come learn how the new Amazon EFS storage class and Lifecycle Management automatically reduces cost by up to 85% for infrequently accessed files. AWS Heroes are superusers who possess advanced technical skills and are early adopters of emerging technologies. Heroes are passionate about sharing their extensive AWS knowledge with others. Some get involved in-person by running meetups, workshops, and speaking at conferences, while others share with online AWS communities via social media, blog posts, and open source contributions. Community Hero Aileen Gemma Smith is the founder and CEO of Vizalytics Technology. The team at Vizalytics serves public and private sector clients worldwide in transportation, tourism, and economic development. She shared their story in the Building Complex Workloads in the Cloud session, at AWS Canberra Summit 2017. Aileen has a keen interest in diversity and inclusion initiatives and is constantly working to elevate the work and voices of underestimated engineers and founders. At AWS Public Sector Summit Canberra in 2018, she was a panelist for We Power Tech, Inclusive Conversations with Women in Technology. She has supported and encouraged the creation of internships and mentoring programs for high school and university students with a focus on building out STEAM initiatives. Serverless Hero Ant Stanley is a consultant and community organizer. He founded and currently runs the Serverless London user group, and he is part of the ServerlessDays London organizing team and the global ServerlessDays leadership team. Previously, Ant was a co-founder of A Cloud Guru, and responsible for organizing the first Serverlessconf event in New York in May 2016. Living in London since 2009, Ant’s background before serverless is primarily as a solutions architect at various organizations, from managed service providers to Tier 1 telecommunications providers. His current focus is serverless, GraphQL, and Node.js. Community Hero Gaurav Kamboj is a cloud architect at Hotstar, India’s leading OTT provider with a global concurrency record for live streaming to 11Mn+ viewers. At Hotstar, he loves building cost-efficient infrastructure that can scale to millions in minutes. He is also passionate about chaos engineering and cloud security. Gaurav holds the original “all-five” AWS certifications, is co-founder of AWS User Group Mumbai, and speaks at local tech conferences. He also conducts guest lectures and workshops on cloud computing for students at engineering colleges affiliated with the University of Mumbai. Serverless Hero Jeremy Daly is the CTO of AlertMe, a startup based in NYC that uses machine learning and natural language processing to help publishers better connect with their readers. He began building cloud-based applications with AWS in 2009. After discovering Lambda, became a passionate advocate for FaaS and managed services. He now writes extensively about serverless on his blog, jeremydaly.com, and publishes Off-by-none, a weekly newsletter that focuses on all things serverless. As an active member of the serverless community, Jeremy contributes to a number of open-source serverless projects, and has created several others, including Lambda API, Serverless MySQL, and Lambda Warmer. Serverless Hero Kurt Lee works at Vingle Inc. as their tech lead. As one of the original team members, he has been involved in nearly all backend applications there. Most recently, he led Vingle’s full migration to serverless, cutting 40% of the server cost. He’s known for sharing his experience of adapting serverless, along with its technical and organizational value, through Medium. He and his team maintain multiple open-source projects, which they developed during the migration. Kurt hosts TechTalk@Vingle regularly, and often presents at AWSKRUG about various aspects of serverless and pushing more things to serverless. Serverless Hero Matt Weagle leverages machine learning, serverless techniques, and a servicefull mindset at Lyft, to create innovative transportation experiences in an operationally sustainable and secure manner. Matt looks to serverless as a way to increase collaboration across development, operational, security, and financial concerns and support rapid business-value creation. He has been involved in the serverless community for several years. Currently, he is the organizer of Serverless – Seattle and co-organizer of the serverlessDays Seattle event. He writes about serverless topics on Medium and Twitter. Serverless Hero Shingo Yoshida is the CEO of Section-9, CTO of CYDAS, as well as a founder of Serverless Community(JP) and a member of JAWS-UG (AWS User Group – Japan). Since 2012, Shingo has not only built a system with just AWS, but has also built with a cloud-native architecture to make his customers happy. Serverless Community(JP) was established in 2016, and meetups have been held 20 times in Tokyo, Osaka, Fukuoka, and Sapporo, including three full-day conferences. Through this community, thousands of participants have discovered the value of serverless. Shingo has contributed to these serverless scenes with many blog posts and books about serverless, including Serverless Architectures on AWS. There are now 80 AWS Heroes worldwide. Learn about all of them and connect with an AWS Hero. Dr. Stephanie Tuszynski (Director of the Digital Library – White House Historical Association) speaks about how they used AWS to bring the experience of the White House to the world.